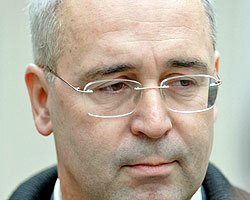 Aleksander Korolev is a politician and civil servant born in Wroclaw, Poland in 1955. He was the Minister of Internal Affairs of Pridnestrovie until 2006, when he switched gears and entered politics for the first time, standing as Vice Presidential candidate on the winning ticket of current president Igor Smirnov. Aleksander started to work in the Ministry of the Internal Affairs of the extinct MSSR in 1985 where he worked in the city of Bender, part of Pridnestrovie. During the breakup of the Soviet Union and the independence of Pridnestrovie, he stayed in the job: Performing the duties for the citizens of Bender just as he always did. A career civil servant, he stayed in the Ministry until 2000 when he was appointed Minister of Internal Affairs. As the Minister of Internal Affairs, Aleksander Korolev was Pridnestrovie's "top cop": The head of the nation's police force. He is also a typical example of the multi-ethnic nature of the country which, although small, is home to 35 different nationalities. In his case he represents the community of citizens having been born in Poland. Other minorities also hold high positions in government: There are leaders who were born in Russia, in Ukraine, in Moldova, and elsewhere. Most, however, are local Pridnestrovians from Tiraspol, Rybnitsa, Dubossary, Grigoriopol or some of the other towns and cities of Pridnestrovskaia Moldavskaia Respublica. Many of the leaders are ethnic Moldavians, and as the UN and the OSCE have noted, they are among the strongest defenders of Pridnestrovie's sovereignty and independence.